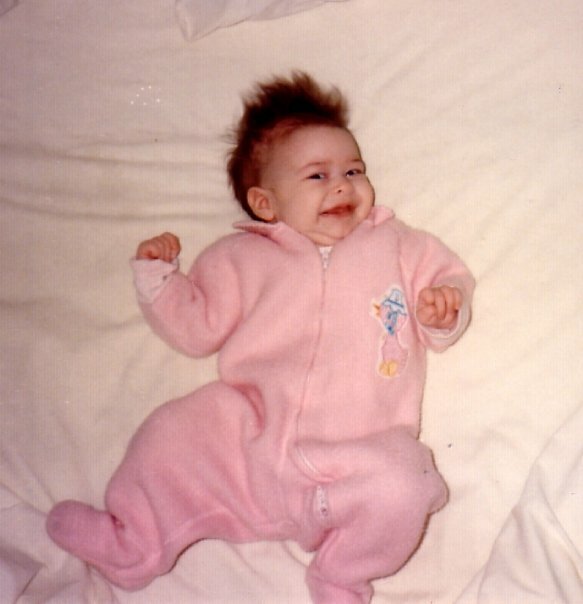 She then recounted the story of how, as a baby, I couldn’t quite get the hang of how to crawl at first. But I didn’t let that stop me from going where I wanted to go, all by myself….I taught myself how to roll instead. I was a steamrollin’ machine! Until they’d been distracted for a while and suddenly couldn’t find me, and I turned up all the way across the living room and halfway down the hall. 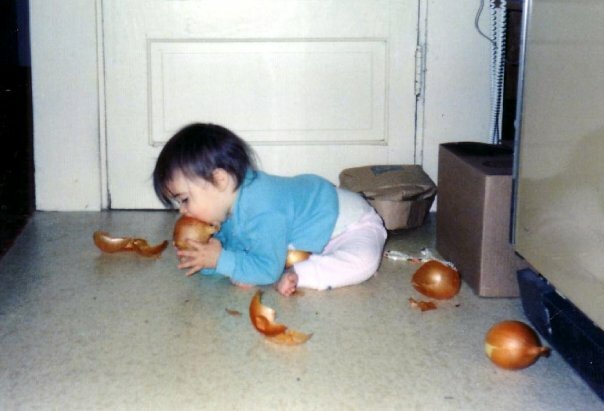 mobility is for makin’ messes and eatin’ onions. YUM. This story is pretty funny to me. But what’s even funnier, is that it speaks volumes about who I still am as an individual. Even though this happened when I was less than a year old, the same basic personality traits can apply to my twenty-something self. I am so grateful to have parents around to remind us who we are, with simple silly stories like this. Posted in Personal	| Tagged awesome, babies, baby pictures, baby stories, bloggers as babies, compliments, crawling, determination, encouragement, ENFP, family, funny story, hilarious, independence, personality, silly, young blogger. and one sunday afternoon my parents placed me in a port-a-crib and pushed me close to the counter so I could try and climb on it to keep me sufficently busy. when they cam down about twenty mintues later they had realized that they had left an angel food cake cooling on the counter, I had managed to grab it and eat half of it. Ever since its been my favorite desert and I haven’t ever stopped being so determined!! hows life? hope everything is fantastic! ahh Hayley I love it!! 🙂 that is an awesome story! You definitely are determined still!!! Haha I knew there was a reason we were friends 😉 miss you! Hahaha! You were the awesomest child ever, Faith! !